• Favorites Scan – Allows you to organize your Systems into Favorites Lists. The scanner will scan multiple Favorites Lists and Full Database at the same time. • 4 GB microSD card (provided - 1 GB up to 32 GB supported) – For storing Favorites Lists, Profiles, all your settings, Discovery sessions, and recording sessions. • Location Based Scanning – Connect to a GPS receiver (not included) for precise system selection and continuing reselection when you travel. The scanner can automatically Avoid and Unavoid Systems and Departments based on your current location as provided by an external GPS unit. • Range Control – Lets you set how far out from your current location the scanner will search for channels in Favorites Lists. Location precision for departments and sites that allows you to define a location and range using rectangles instead just of a single circle. • Trunk Tracker V Operation – Scans APCO 25 Phase 1 and Phase 2, DMR, Motorola, EDACS, EDACS ProVoice, and LTR trunked systems, as well as conventional analog and P25 digital channels. • Multi-Site Trunking – Lets you program the scanner to share trunked system IDs across multiple sites without duplicating IDs. • Control Channel Only Scanning – With Motorola trunking frequencies, you do not have to program voice channel frequencies. • Instant Replay – Plays back up to 240 seconds (4 minutes) of the most recent transmissions. • Audio Recording – Capture transmissions for later playback. • Custom Alerts – You can program your scanner to alert when you receive, a Channel or Unit ID, a Close Call hit, an ID is transmitted with an Emergency Alert, or a Tone-out hit. For each alert in the scanner, you can select from 9 different tone patterns, 15 volume settings, 7 colors, and 2 flash patterns. • Multicolor LED Alert – The alert LED with 7 colors, Blue, Red, Magenta, Green, Cyan, Yellow, or White, can be used with your Custom Alerts. • Trunking Discovery – Monitors system traffic on a trunked radio system to find unknown IDs and automatically records audio from and logs new channels for later review and identification. • Conventional Discovery – Searches a range of frequencies to find unknown frequencies and automatically records audio from and logs new channels for later review and identification. • Scan by Service Types – Scan your channels by Service Type i.e. Fire, Police, Railroad, etc. • Search Speed – 80 step/sec. (typical) in Search mode (max) except for 5 kHz steps. 250 step/sec. (typical) in Search mode (max) – (Turbo Search) for 5 kHz steps. • Multi-Level Display and Keypad light – Makes the display and keypad easy to see in dim light with three light levels. • Temporary or Permanent Avoid – For Systems/Sites/Departments/Channels. • System/Channel Number Tagging – Number tags allow you to quickly navigate to a specific Favorites List, System, or Channel. • Start-up Configuration – You can program each of your Favorites Lists with a Startup Key (0-9) so that when you power up the scanner and press the key number, just those Favorites Lists assigned to the key will be enabled for scan. • Close Call© RF Capture Technology – Lets you set the scanner so it detects and provides information about nearby radio transmissions. Close Call Do-not-Disturb checks for Close Call activity in between channel reception so active channels are not interrupted. • Broadcast Screen – Allows the scanner to ignore hits in search and Close Call modes. You can also program up to 10 custom frequency ranges that the scanner will ignore. • Fire Tone-Out Standby/Tone Search – Lets you set the scanner to alert you if a two-tone sequential page is transmitted. You can set up to 32 Tone-Outs. The scanner will also search and display unknown tones. • PC Programming – Use the Sentinel software to manage your scanners Profiles, Favorites Lists, and firmware updates. • Analog and Digital AGC – Helps automatically balance the volume level between different radio systems. • Priority/Priority w/DND Scan – priority channels let you keep track of activity on your most important channels while monitoring other channels for transmissions. • Priority ID Scan – Allows you to set priority to talkgroup IDs. • Intermediate Frequency Exchange – Changes the IF used for a selected channel/frequency to help avoid image and other mixer-product interference on a frequency. • Individual Channel Volume Offset – Allows you to adjust the volume offset for each channel. • Configurable Band Defaults – Allows you to set the step (5, 6.25, 7.5, 8.33, 10, 12.5,15, 20, 25, 50 or 100 kHz) and modulation (AM, FM, NFM, WFM, or FMB) for 31 different bands. • Adjustable Scan/Search Delay/Resume – Set a delay up to 30 seconds or a forced resume up to 10 seconds for each channel or search. • Data Naming – Allows you to name each Favorites List, System, Site, Department, Channel, ID, Location and Custom Search, using up to 64 characters. • Duplicate Input Alert – Alerts you if you try to enter a duplicate name or frequency already stored in the scanner. • 100 Quick Keys – You can scan Favorites Lists, Systems, and Departments by assigning them to quick keys. 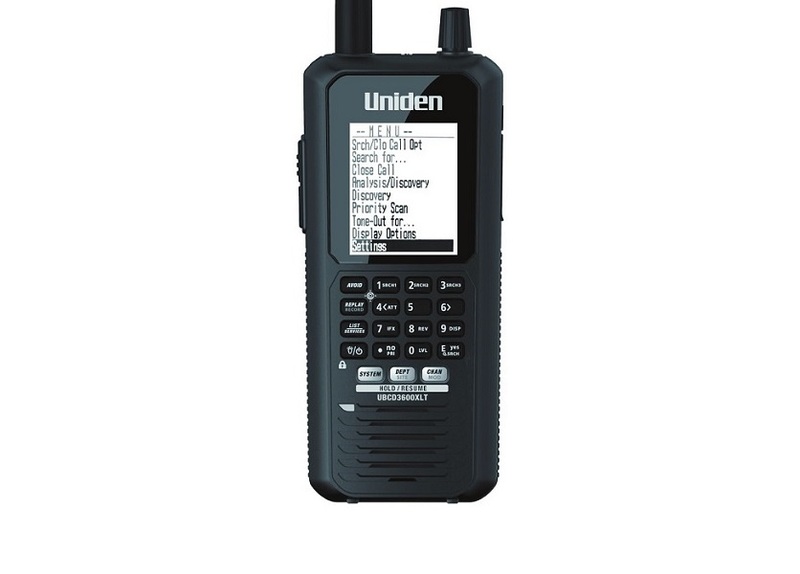 • Search Avoids – You can temporarily Avoid up to 250 frequencies and permanently Avoid up to 250 frequencies in any Search mode or Close Call mode. • 10 Custom Searches – Lets you program up to 10 custom search ranges. • Search with Scan Operation – Lets you include Custom Search ranges during scan operation. • 3 Search Keys – You can assign 3 of the number keys to start a Custom Search, Tone-Out Search, or Close Call Search. • Quick Search – Lets you enter a frequency and start searching. • Built-in Battery Charger – Allows you to charge the batteries in the scanner.